Carla M. Landon is sworn in as the newest member of Campbell County Public Library’s Board of Trustees by Campbell County Judge-Executive Steve Pendery at Judge Pendery’s office at the Campbell County Fiscal Court building, Newport, on Wednesday, Aug. 19. Lifelong Campbell County resident Carla M. Landon gained a passion for libraries at a young age. Now she’s bringing her passion and skills in community leadership and public relations to the Campbell County Public Library as the newest appointed member of its Board of Trustees. Ms. Landon of Fort Thomas, chair of the Northern Kentucky Forum since January 2013, was appointed to the Library’s Board of Trustees on August 5. 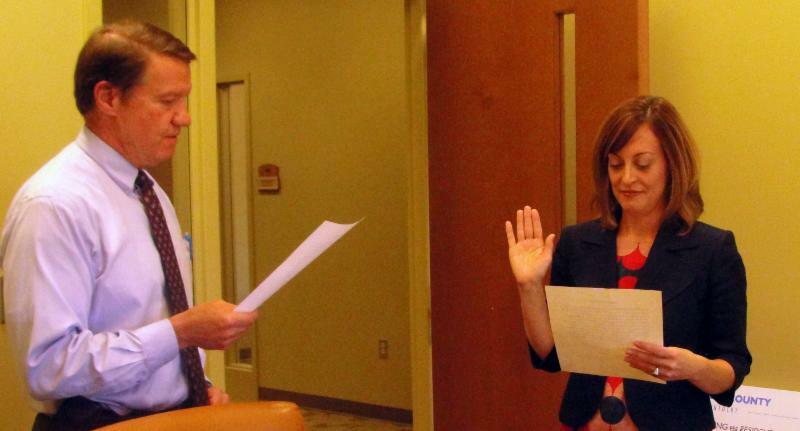 She was sworn in by Campbell County Judge-Executive Steve Pendery Wednesday. Ms. Landon replaces board member Mike Whiteman, who resigned in April when he moved out of the county. Ms. Landon was appointed to fill the two remaining years of Mr. Whiteman’s unexpired term. “We are fortunate to have a well-qualified candidate who cares deeply about the future of the Library. She is looking forward to applying her career experiences to the challenges facing CCPL and all libraries today,” said Cathy Howard, Board president. As Chair of the Northern Kentucky Forum, Ms. Landon manages the organization’s communications. She also has served the Forum as vice chair and marketing/public relations committee co-chair. She was in Leadership Northern Kentucky, class of 2015, and has served in leadership roles in several other organizations. Her first official meeting with the Board was Wednesday, August 19. The Library advertised openings for the board positions for two months, and candidates submitted resumes to apply. Board members interviewed all applicants and submitted the names of two potential candidates to Kentucky State Librarian Wayne Onkst. The State Librarian sent the nominations to Campbell County Judge-Executive Steve Pendery. The fiscal court approved Judge Pendery’s appointment of Landon on August 5, 2015. Key issues facing the upcoming board include the 2012 lawsuit currently before the Kentucky Supreme Court and the development of a long-range plan. Other current board members include Howard, Vice President Steven Trumbo, Treasurer Paul Johnson, and Secretary Christie Fillhardt. The board meets at 5:30 p.m. on the third Wednesday of every month, rotating locations among the branches. Meetings are open to the public.